A recent study carried out at airmid healthgroup found that new pillows contain contaminants, including indicators of human and animal faecal pollution. Fifteen feather and down pillows purchased from prominent e-commerce companies were analysed at airmid healthgroup’s feather and down laboratory in Dublin. High levels of bacteria and fungi were found in the filling of thirteen of the pillows. 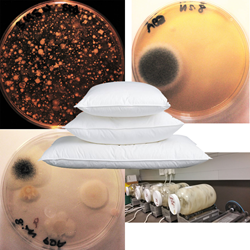 Further testing led to the presumptive identification of Clostridia in nine pillows, Salmonella in five and Faecal streptococci in one of these pillows. Salmonella and Clostridia can come from human and animal faeces and are common culprits of food poisoning. Faecal streptococci can also cause food poisoning as well as ear and urinary tract infections. Only two of the fifteen pillows tested were found to have safe levels of all tested contaminants. People with asthma or allergies were advised in the past to avoid feather products. This was more often related to the concept that the patient’s allergy was mite-related, rather than components of the feather ‘bloom’ itself. Feather bloom, associated with unrefined feathers, consists of duck serum proteins including IgG, feather mites and their faeces, all of which are potentially allergenic. Six of a subset of ten of the pillows tested by airmid healthgroup were found to contain up to 1 milligram of duck IgG per gram of pillow filling, which is above the safe level for people with asthma and other allergies. “This preliminary study is of great concern as it shows a lot of the feather and down filling sold into the market place that we tested was not fit for purpose from a public health perspective,” says Dr Bruce Mitchell, airmid healthgroups’s CEO and Chairman. While a minority of feather and down processors use state-of-the art washing procedures, many do not. A more stringent regulatory system is required for testing the outcomes of feather and down processing. Current standards and test methods do not take into account modern technology and rely on procedures that have poor sensitivity and specificity. The findings may encourage the consumer to rethink their expensive feather and down bedding. While the consumer may assume that the more luxurious items are the best, the results of the current study suggest that this is not necessarily the case. airmid healthgroup advises that a new father and down safety standard is needed. This new standard should communicate to the purchaser that the feather and down in their product has been processed and is guaranteed not to contain unwanted and harmful contaminants.